2000 was a mountainous year for the Israel-Palestinian conflict. It heralded the start of the current uprising of armed Palestinians targeting mostly unarmed Israeli citizens. It was also a year of seemingly amazing progress as then Israeli PM Ehud Barak took Israel closer than she had ever been to reaching an end of conflict agreement. There have been numerous debates regarding what Israel really offered in 2000; first at Camp David and then by agreeing to the even more generous Clinton Parameters. Both deals were outrightly rejected by Arafat, without him even making a counter offer. Palestinians repeatedly claim that the Israeli offer amounted to nothing less than a series of non-contiguous Bantustans preventing any viable Palestinian state. Dennis Ross was the lead US envoy to the Middle East from 1988-2000. Few people can claim to have been as committed to the cause of peace in the Middle East as much as Dennis Ross has been. 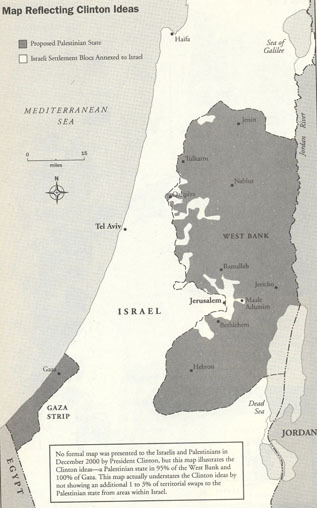 In his recent book "The Missing Peace" Ross includes maps depicting the offers that were on the table for the Palestinians. Palestinian Characterisation of the Final Proposal at Camp David. 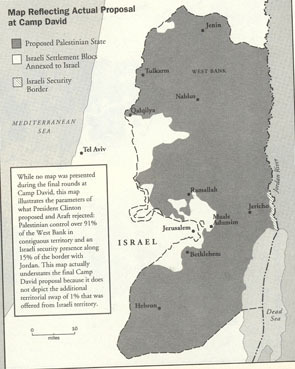 While no map was presented during the final rounds at Camp David, this map illustrates the parameters of what President Clinton proposed and Arafat rejected: Palestinian control over 91% of the West Bank in contiguous territory [and 100% of Gaza] and an Israeli security presence along 15% of the border with Jordan. This map actually understates the final Camp David proposal because it does not depict the additional territorial swap of 1% that was offered from Israel territory. Finally, this map reflects the Clinton Ideas of December 2000. These ideas were accepted by Israel but were rejected by the Palestinians. 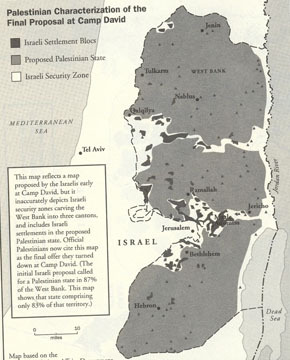 No formal map was presented to the Israelis and Palestinians in December 2000 by President Clinton, but this map illustrates the Clinton ideas--a Palestinian state in 95% of the West Bank and 100% of Gaza (bringing total territory relinquished by Israel to 97%). This map actually understates the Clinton ideas by not showing and additional 1 to 3% of territorial swaps to the Palestinian state from areas within Israel. Think about it...the monstrous images captured over the past four years could rather have been sources of wonderment had Arafat just said "Yes". Stay tuned to It's Almost Supernatural for more details of what was proposed by in the Clinton ideas in term of security, territory, the refugees, and Jerusalem. You can read my first entry concerning the Dennis Ross book here. Thanks a million for this. I got to you through Discarded Lies blog. I've never known where to find these maps. They're now in my favourites. Pleasure...is discarded lies the blog that started as LGF watch watch? I think so. It's a spin off of LGF anyway, with many (or mostly) LGFers posting and commenting on it. Oops, sorry, forgot to post a link. http://www.discardedlies.com/ is the link for the site. Great post, Steve. I'll be linking back to you for this one. This is a map by "the other side" from you point of view. It was drawn by Foundation for Middle East Peace and presented by Gush Shalom as well. Nonetheless it is not a map of "Bantustans" and could have been the basis for a deal. It is a lot more than Barak ever admitted to offering. The problem is, that it is very unlikely that Barak could have gotten support for that map in a referendum in Israel. The Oslo accords failed because Palestinians and Israelis still have national goals that are incompatible with each others' existence as free peoples, and with peace. These goals are accepted by a large national consensus on each side, and are encouraged by leaders rather than discouraged, in order to give them strong bargaining positions in the negotiations. them, whats are the price(s) and what types? It heralded the start of the current uprising of armed Palestinians targeting mostly unarmed Israeli citizens. It was also a year of seemingly amazing progress as then Israeli PM Ehud Barak took Israel closer than she had ever been to reaching an end of conflict agreement. Was really a nice blog congratulations for this beautiful moments. I would always follow the articles. Congratulations, are you really good articles. the bug-sympthoms are well known, but the way to get that behaviour is new i guess. are you shure, this only happens on that one server? are the other servers running ut2vote too? is it shure, that it only happens with rejected maps, or might it be randomly with all maps? I remember that bad year!Very good article! I’m living between 3 homes in 3 cities at the moment so will have to be minimalistic about supplies I can carry around with me! Great post and loved it. Great going keep it up and expect more of this kind in future.